Located in the Melbourne beachside suburb of Mordialloc, Albatross Brewing has started production at its own facility, with plans to open to the public soon. Owner and head brewer Steve Laughlin started the Albatross brand in 2016, and after running out of places to brew under contract decided it was time to open his own brewery. Laughlin began his beer industry career at Two Birds Brewing after being in the police force for 12 years. 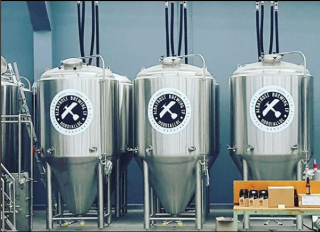 He has installed a 12-hectolitre brewhouse at the Mordialloc site that can make 18,000 litres of beer at a time, including the Mordy Carnival Pale Ale, Mordy Bayside Summer Ale and Black Knight Porter. Albatross has also committed to giving ten per cent of all sales to a charity that supports the tertiary education of veterans. “We’re donating a percentage to Wounded Heros Australia. It’s all about giving back, having been a police officer these causes are important to me,” Laughlin told Brews News. An aviation enthusiast, Laughlin named his brewery after the Albatross fighter aircraft, flown by WWI pilot ‘The Red Baron’. He says he wants to see the same quality and ingenuity of the Albatross aircraft come through in his beers. They can be found on tap at 35 venues around Melbourne and soon via Dan Murphy’s, according to Laughlin. The Albatross beers were previously packaged in bottles, but the company has recently made the switch to cans. The brewery’s Mordialloc location puts it in the vicinity of other breweries such as Braeside’s Boatrocker and Bad Shepherd in Cheltenham.